Pizza is good. There’s no doubt about it. There are so many toppings that can be used it makes variations endless. 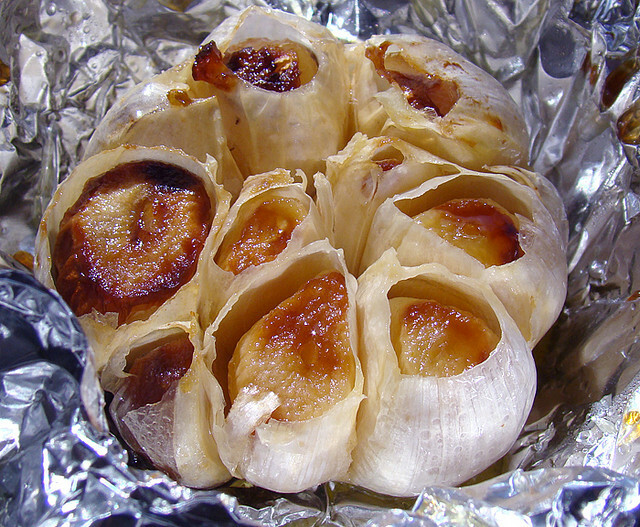 One of my favourite ingredients is roasted garlic. Lots of it. Believe it or not, though the "sauce" is at least half garlic, this pizza is not overpowered by it. It has just enough. 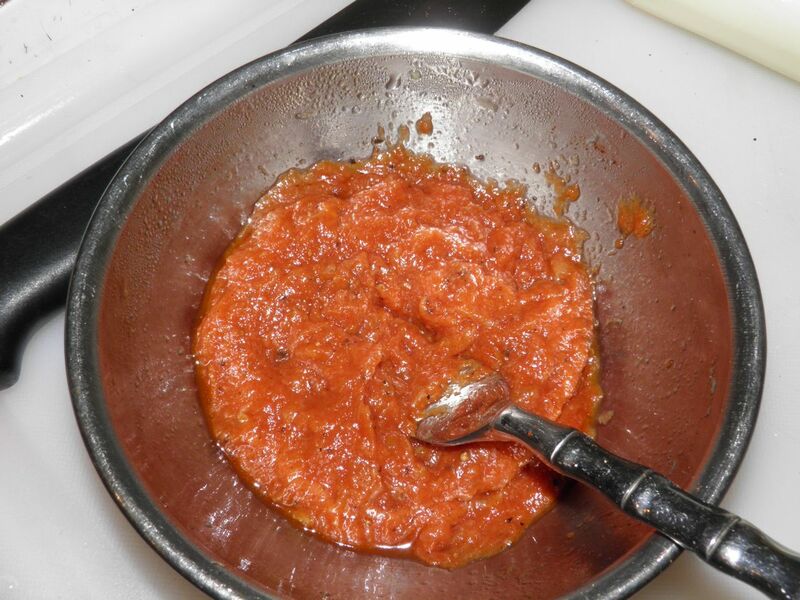 This is the delicious garlic-tomato "paste." This recipe substitutes pizza sauce for an amazing concoction made of roasted garlic, tomato paste and olive oil. It more than stands in as a good substitute. The roasted garlic can be done a day ahead if desired and mashed with the oil. It will keep for quite a while in that way if refrigerated. 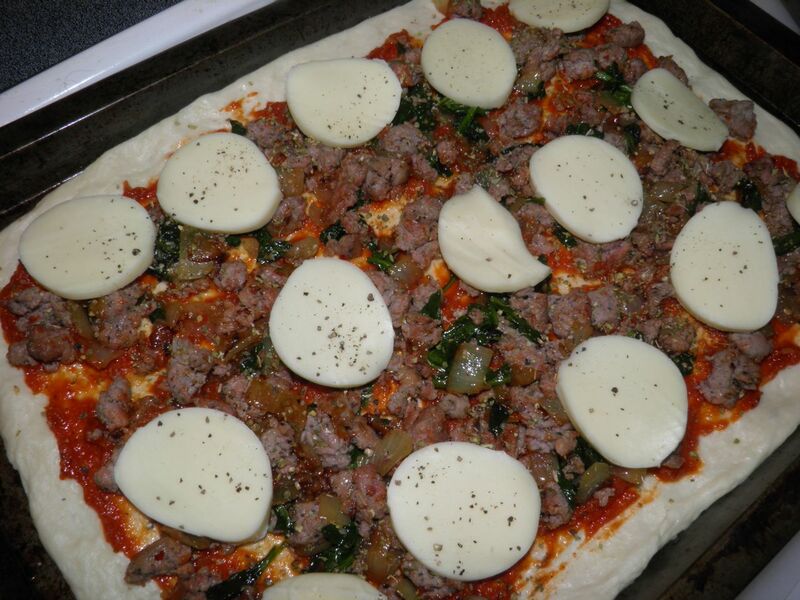 Cook the toppings before placing on the pizza. I had some homemade Italian sausage hanging around… If you’re a frequent reader you will remember I made my own hot & sweet Italian sausage a few posts ago. I have to admit, it’s really tasty and very easy to make. Click HERE to find the post. I also went out back and picked some spinach to use. We purchased several spinach plants earlier in the season for just this sort of use. Spinach goes extremely well with Italian sausage and garlic on pizza. No, I didn’t make the Provolone cheese. I bought it. I didn’t try to pull that big of a “Marta Stewart.” Although I do know a recipe… FYI, there's a trick to putting cheese on a pizza, believe it or not. Read the recipe below for a cook’s secret. Making the pizza dough from scratch does take some time, about 2 hours, but it’s definitely worth it. Click HERE for the post. I have a quicker 45 minute pizza crust HERE, which is equally as good. Cook's secret: Don't grate your cheese!!!! Make your favourite crust for one pizza. A favourite of mine (my honey crust) is searchable on this blog. There’s a quicker crust posted as well. Preheat the oven to 400°F. 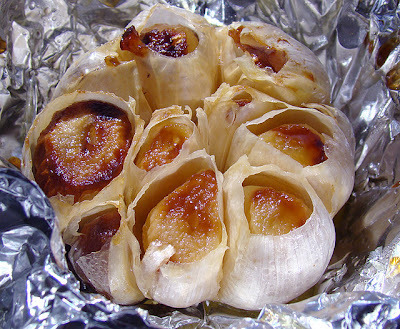 Roast garlic by cutting off the tops and pouring a little olive oil on top of each one. This will take 45 minutes but after that time the cloves will be very soft. Remove from the husk and mash with 2 tbsp of olive oil. Mix in the tomato paste and water. Set aside. Turn the heat in the oven up to 425°F. After 22 minutes in the oven. Heat a large frying pan and sauté the onion with a little olive oil. 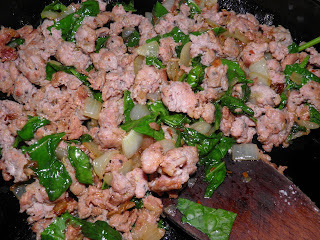 Once it has softened add the sausage meat. As the meat fries break it up into chunks with a wooden spatula. Cook until the sausage is done. Add the spinach and toss to let wilt slightly. Add the salt and half the pepper and then set aside. This all should take 15 minutes, maximum. 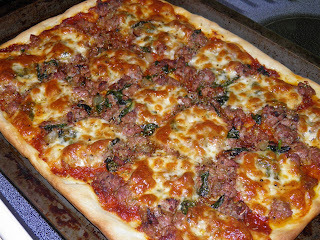 After the crust has risen, punch down and spread out on a buttered or oiled pizza pan. If desired, let it rest for 10 minutes to rise a little. Spread the garlic tomato paste over the crust. Then spread on the meat mixture. Then add the cheese. Almost without fail we grate soft cheeses for on top of pizzas but that steams whatever ingredients are underneath. That’s not good. Here’s a cook’s secret for you: a better method is to cube the cheese, or if your cheese is cylinder-shaped like Saputo Provolone, cut it into thin rounds, as in the picture. This lets the cheese melt into the pizza and the ingredients around it to cook properly. Any hard cheese like parmesan or Romano will still have to be grated. Sprinkle the oregano and remaining pepper on top. 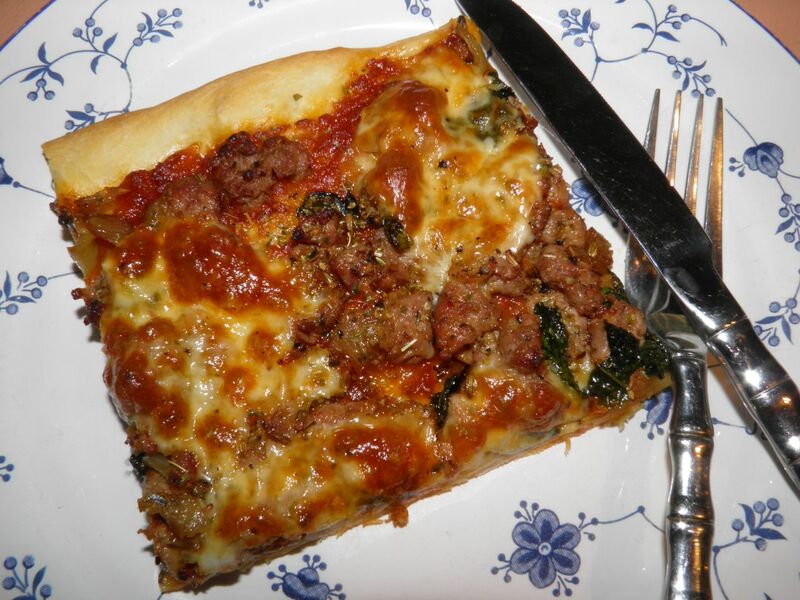 Place the pizza in the centre of the oven and bake for 20-25 minutes, or until the bottom crust is browned and the cheese is bubbly.